I’m always looking for recipes with chocolate and nuts, and lately I’ve been on a pecan/ walnut binge, so it was fun to make this tart that reminded me of how magical almonds and chocolate are together. It’s likely there will be more chocolate almond combos coming your way after this smashing success. The texture of this tart is almost caramel like, it was really interesting and so so easy to make. The original recipe calls for milk chocolate chips, she says that the dark or semi-sweet option made it too rich for her. 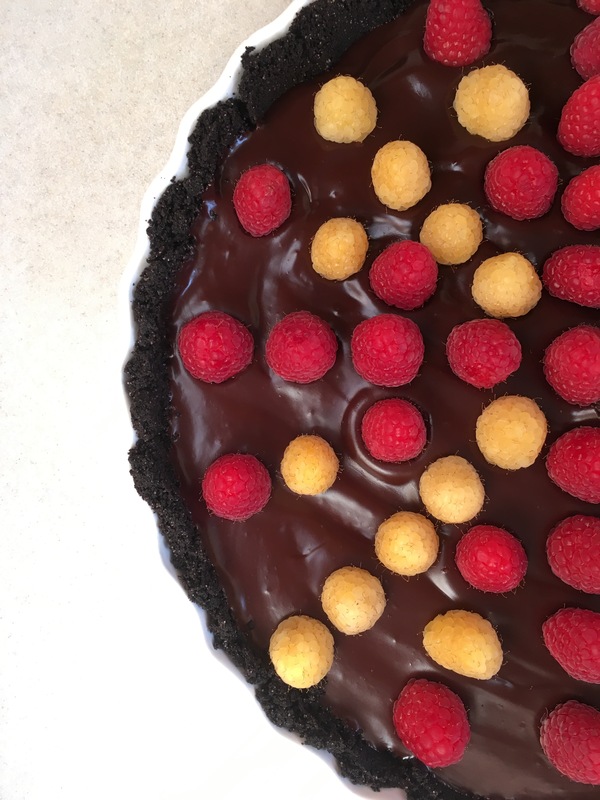 I am not familiar with the sensation of something being “too rich” – I used a combination of semi-sweet and dark chocolate and I thought it was just right! Preheat oven to 400. For the crust: In a medium bowl, cut the butter and flour with a pastry blender until mixture is crumbly. Add the beaten egg. Stir until a dough forms. Press the dough firmly into a tart pan or 9″ pie tin. Bake for 12-14 minutes or until golden brown. Cool on a wire rack. Reduce oven to 350. For the filling – in a medium saucepan, melt butter over low heat. Add the sweetened condensed milk, chocolate chips, and extracts. Cook over low heat, stirring occasionally, until chocolate is melted. Stir in the almonds. Pour and spread evenly into the tart crust. Bake an additional 23-25 mintutes or until the edges are set but the center still has some jiggle. Cool in the pan on a rack. Serve in slices, garnished with whipped cream and chopped almonds on top.